Can you believe that more than one dog has SHOT its owner? Would you believe dogs have eaten everything from rugby balls to bicycle handlebars? 1.Luke, a four year old Doberman from the West Midlands, ran up a bill of more than £215 after a 38 inch leather belt had to be removed from his stomach. 2.Rusty, a Bull Terrier from Kent astonished vets after managing to consume a pair of bicycle handle bars. 3.Mr A Mills of Motherwell, whose Border Collie was not insured, attempted to claim on his home insurance after an accident in his back garden, when he accidentally peppered poor Mandy with air rifle pellets. 4.Following an attack from a pet Burmese python, Rudy’s injuries cost his owners the princely sum of £2,400, plus the loss of the snake. 5.Bayley, a five year old Dachshund from Hinckley in Leicestershire, required urgent attention after snacking on two of his owner’s golf balls. 6.Sian, a three year old mongrel from Swansea, broke her leg after falling from a sit-down lawnmower. This cost Huw Pickering, a retired insurance broker, £2,000 in vet’s bills. 7.Lee Sidney was left in tears after falling on top of his West Highland terrier, Jake, and fracturing two of the dogs ribs during a barbecue at his rugby club. 8.Lincolnshire couple Ruth and Marco LaBrie were charged £216 by the vet that removed assorted nuts and bolts from the stomach of Nelson, their Bassett. 9.Gemma, a miniature Schnauzer from Reading, diced with danger after swallowing a tube of super-glue. A second operation was necessary when the stitches became loose. 10.Gentle giant Mal the St Bernard needed surgery after destroying his gums by trying to clean the remaining bits of potato from a potato peeler at his home in St Helen’s. 11.Thirsty German Shepard Lucy received a nasty gash to the back of the head after a toilet lid slammed down on her. 12.Melanie Silcox had to rush Duke, her six month old Rottweiler, to the vet after her three year old son fed him the contents of a pub ashtray with his dinner. 13.A Dalmatian puppy called Jordan caused trouble for himself in Portsmouth after licking the wet paint from the side of his kennel. Luckily he only suffered a mild case of poisoning . 14.Charlie, a Yorkshire Terrier from north Wales, managed to damage his left eye severely after pulling a cuckoo clock from a wall and onto his face. The cost of his treatment more than £1,000. 15.‘Sam has always been a naughty dog, but he has done nothing like this before’ was the response of a woman rendered homeless by her dog’s actions. Sam chewed through an empty aerosol can, sending a fire ball through the property completely destroying it. No dogs were hurt, just two cats. 16.Firemen in Blackpool spent two hours trying to release Danny, a two year old Springer Spaniel, from underground piping in a children’s play park near his home. He got stuck in the same place two weeks later. 17.Leo, a five year old Labrador from Harrow in Middlesex, ended up underneath his owner’s motorbike after chewing through the kickstand. Leo didn't regain full mobility for five weeks. 18.Embarrassment was overcome by fear for one dog owner in Devon. He had to drive his Manchester terrier, Alfie, to the vet after he ate his wig. 19.Junior, a mixed breed from Warrington, put the frighteners up owner, Lindsey South. Whilst out walking, Junior ran off to fetch a stick that Lindsey had thrown for him. When he returned he had an unused firework hanging from his mouth. 20.Berry, a ten month old collie, suffered in the name of football. The family’s eight year old son had put his Manchester city strip on the dog, inadvertently restricting her walking ability. It was only a matter of time before poor Berry went flying down the stairs severely hurting her front leg. The cost of her treatment more than £1,000. 21.Robin Wylde and his dog Sally were out walking in a local park when a remote controlled airplane ‘came out of nowhere and careered into the side of my dog’s head.’ Sally needed six stitches in her ear. 22.Bad breath was the least of Irish Setter Shane’s worries. He was treated by vets in Swindon after eating an entire leather shoe. 23.Sky, an eighteen month old German Shepherd, shocked his owner after chewing through a can of shaving gel and then eating the entire contents. Although he was rushed to the local vet, Sky showed no ill effects. 24.Inquisitive mongrel Stanley from Whitehaven in Cumbria, needed rescuing after getting his head firmly lodged between two steel railings near a local school. Stanley had escaped and it was thought that he was trying to visit the ducks that the school kept as pets. 25. £139.50 was the total cost of treatment required for Ghandi, a St. Bernard who ate his owner’s hair curlers. 26.Unlucky Basset Willy had two near misses in one day. First he was taken to the vet’s after consuming half a tin of shoe polish, then later in the day he returned to the surgery after swallowing a battery from a television remote controller. 27.Yorkshire Terrier Barney had to wait three days before 33 missing jigsaw pieces were retrieved from his stomach. 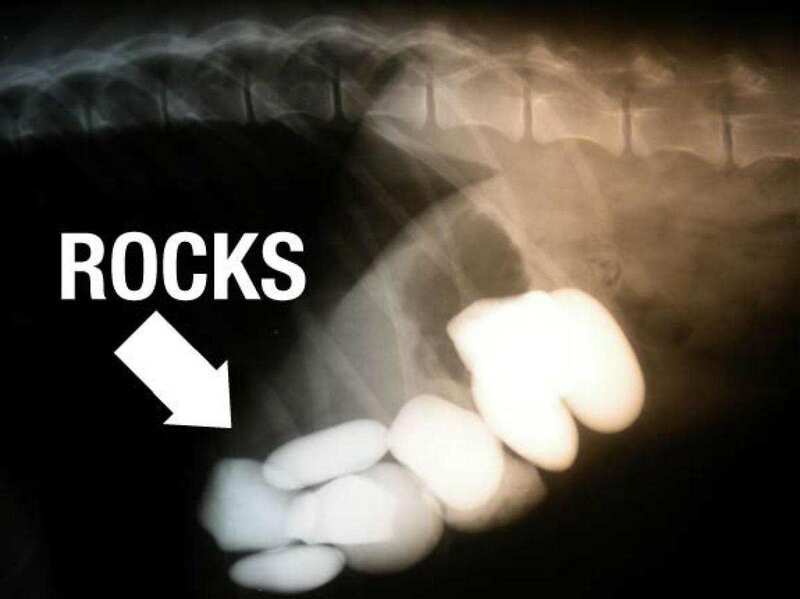 X-rays alone cost his owners more than £180. 28.Lincoln the Dalmatian puppy got himself into a ropey situation in his home town of Leeds. He chewed the head of a Barbie doll and swallowed it causing himself a severe stomach upset. 29.Sheba, a two year old German Shepherd from Scarborough caused havoc recently when she nearly burned down her house. She stood up on her hind legs to inspect the contents of what turned out to be an empty saucepan. ‘Sheba must have slid the dial to number five and I simply didn’t notice until it was too late,’ claimed the dog’s owner. Nobody was hurt but the house still had the unwanted musk of a burnt saucepan. 30.Sue Greenway was shocked to return to an empty parking space after popping into a shop for some flowers. She had left Sooty, her three year old black Labrador in the car. During her absence Sooty somehow managed to release the handbrake causing the car to roll backwards into a recycling bin. Police officers attending the incident insisted that the handbrake was not fully engaged while Sue maintains that it must have been Sooty’s doing. Sooty sustained a minor leg injury. 31.Vets in north London were astonished to discover upwards of £600 worth of jewellery, including a platinum plated brooch, inside the stomach of Luther, a four year old Bull Mastiff, after he became lethargic and lost his appetite. Equally astonished were Luther’s owners, who did not recognise any of the pieces. 32.Charlie, a 13 week old Poodle from Nottingham astonished his owners and a local vet after being run over by the family’s. ‘Charlie just sprang up and ran into the garage. I thought we would be scraping him off the drive,’ commented next door neighbour Jason Webber. 33.Two year old poodle Abbey from Leicester did well not to start a fight or make a pass at an inappropriate neighbour during a street barbecue last summer. She polished off an entire bowl of punch, containing half a bottle of vodka. The vet had to be called out as no-one was sober enough to drive her to the surgery. 34.Legal action was taken against Ross Shepard after it was alleged that his Labrador, Lloyd, had urinated on a six month old baby in a pushchair. The case never got to court as the child’s father could not prove it was Lloyd who committed this most heinous of deeds. 35.Lucy Moore, a 16 year old dog walker from Bristol, thought she had seen the last of Bradley, a German Shepherd belonging to her next door neighbour, after throwing a stick for him near a local quarry. The fire brigade were called out after the wind carried the stick over the quarry edge. The travelling stick proved too tempting for Bradley, who promptly followed it to the bottom of the quarry, receiving a broken leg for his efforts. 36.Christmas was ruined for eight year old Jason Bellamy from Preston. Jason’s twelve months of impeccable behaviour earned him, quite rightly, a brand new games system. However, family Dachshund Glen demonstrated his disgust at receiving an inferior gift (unconfirmed reports suggest it was a squeaky Santa) by going to the toilet on Jason’s new present, subsequently invalidating the warranty. This cost Jason’s step-dad the best part of £200. 37.Chubby Jack Russell Bobby from West Sussex was showing of his hunting prowess when he managed to get himself firmly lodged in a rabbit hole. He had to be pulled out by his owner. 38.Ralph, a Yorkshire Terrier puppy from Mablethorpe, cost owner Aaron Johnson a self-employed painter and decorator, £453.90 after he ate the contents of Aaron's wallet. 39.Dog owner Geoff Millburn had to be restrained after his dog was nearly run over by a council steamroller. 40.Being late for work seemed rather irrelevant to Ian Russell from Telford after he discovered that his missing car keys had been eaten by his Border Collie Ramsey. The vet’s invoice came to more than £300. 41.Motorist Darren Talbot was more than £60 down after his dog, Lucy, completely ruined his gear stick by chewing it. 42.Old English Sheepdog Blake needed urgent attention, not from a vet but from a groomer, after he managed to cover himself with industrial waste. 43.Bedford vets marvelled at the lack of damage sustained by Belle, a Cocker Spaniel who set her tail on fire in her owner’s kitchen. 44.Fun loving West Highland Terrier, Chelsea enjoyed a relaxing afternoon in the garden after consuming the contents of an unattended barbecue. 45.Gordon, a Wire Haired Pointer, suffered daffodil poisoning. His treatment cost £300. 46.Slug pellets consumed by a Dalmatian on the Isle of Man meant veterinary bills of more than £350 for his owners. 47.Unlucky Labrador Eddie was hit in the face by a cricket ball. Surgery and treatment cost more than £400. 48.Three operations were needed for Yorkshire Terrier Manu, to rectify stomach problems caused by vast consumption of sea weed. 49.A short-sighted Doberman from Shropshire needed more than £430 worth of treatment after he smashed his way through a patio window. 50.Severely lacerated legs caused by a glass-top table cost the owners of Sumo, a Staffordshire Bull Terrier, more than £760. 51.Danny, a Springer Spaniel suffered severe electrical burns to his mouth after chewing through electrical wiring at his home in Devon. Treatment cost more than £200. 52.Ricky, a Shetland sheepdog from London suffered painful cuts to his mouth and tongue after snacking on his owner’s mobile phone. 53.Black Labrador Shadow was completely oblivious to any commotion after wolfing down half a bottle of sleeping pills that had fallen from a shelf in the bathroom. His treatment cost his owner just under £255. 54.Urgent surgery was required for Benji, a Bull terrier from Cardiff, after he swallowed a hearing aid. The cost of surgery totalled more than £250. His owner couldn’t believe what he was hearing. 55.Josh Westly from High Wycombe had to shell out more than £400 after his dog Silver ate a plastic bin liner, almost choking herself to death. 56.Cross breed Andy from Dorset suffered cuts to his mouth after chewing on a very rotten piece of wood. 57.Inquisitive mongrel Ruben was on the wrong end of a horse’s hoof at a farm in Northamptonshire, fracturing his jawbone in five places. The cost of resetting his jaw was more than £900. 58.Kim the Basset Hound was left in severe pain after disturbing a wasp nest in her garden. 59.Anakin, a one year old Akita was poisoned after swallowing eye solution left on a table. This cost £327.85 in vet’s fees. 60.Too many chocolate coins proved costly for the owners of Rosie, a seven year old Poodle. They had to spend £129.50 on Boxing Day to treat theobromine poisoning. 61.After killing and eating a rat, which had eaten rat poison, Freddie, a 17 month old West Highland Terrier ingested the poison and was lucky not to have suffered more than he did. Treatment cost just under£50. 62.After falling in a neighbour’s vehicle inspection pit, elderly terrier Hamish was trapped for three days until the neighbours returned from a holiday. The poor lad suffered hypothermia and lung congestion and had damaged his claws trying to scramble out. 63.Warfarin poisoning to a farm dog called Casper resulted in him being given a blood transfusion. This cost his owners £913.02. 64.Kara, a six year old Pointer, locked her jaw when bringing in the mail for her owner. She was referred to a specialist, which cost her owners £393.85. 65.Tess, a four year old Rough Collie, needed more than £400 worth of treatment after the gate to her kennel blew shut in her face. 66.Rupert, a four year old pet Greyhound from Sheffield needed surgery to his eye after he bit a guitar string. The string snapped and whipped his face, causing severe lacerations to his cornea. 67.A six year old Dalmatian from South Shields on Tyneside required surgery costing more than £550 after she pulled a spade from a hook on the garage wall and it landed on her back. 68.Jackie Reece's two English Springers cost her more than £200 when they destroyed a neighbour's water feature. 69.It cost just under £320.00 for the owners of Stella, a four year old Weimaraner from Basingstoke, to pay for treatment to the dog’s left eye following a fence collapse in her garden. 70.Kelley, a six year old cross breed from Denby in North Wales, incurred veterinary bills of more than £1,000 to repair her front legs when she knocked over a ladder and tool box. 71.Delia, the Yorkshire Terrier from Liverpool. needed urgent attention after drinking from a freshly bleached lavatory. She sustained severe blistering in and around her mouth. 72.When nine month old Doberman Ray attempted to chew a broom lots of bristles got stuck in his gums and throat. 73.Yorkshire Terrier Tiny found himself on the wrong end of a playful bite from a Rottweiler. It cost his owner £300 to have Tiny’s broken ribs repaired. 74.Amba, the Border collie has fascination with stones. This has cost her owners more than £1,400 to have them removed. 75.Mick, an English Springer from Nottinghamshire had to have his shoulder pinned after he was accidentally hit by a cyclist. 76.A 14 month old Cocker Spaniel in Boston, USA managed to completely burn down his owner’s house after bringing in a smouldering stick from an unguarded outside fire. 77.Hansel, a nervous German Shepherd, was being cared for by family friends when he ran out into the road whilst attending a vet surgery. He caused causing a car crash and a medical claim of more than £40,000. 78.When Seeker, a young Rottweiler from North Carolina, took herself on a stateside tour of America her owners ended up paying more than $5,000 dollars in advertising to recover the wandering K9. They collected her from a rescue centre in Michigan! 79.Ronnie the rocking rover went missing from his home in Suffolk and managed to hike his way to Leeds. 80.Strange but true - a dog in South Africa had to have a complete, full sized rugby ball removed from his stomach. 81.Tanika, a cross breed owned by Danielle and Gavin Reece from Newport in Wales cost her owners more than £600 when she had to have her leg repaired following a run in with a large unseen stone. 82.Sparky, an overweight Cocker Spaniel had to have treatment for arthritis in his hips. This cost his owner more than £1,800. 83.Benji has a penchant for a little known culinary delight called coal. His love for the fossil fuel stretches as far as him collecting several pieces and eating them in his bed along with raw potatoes, small stones and tennis rackets. 84.A Romanian woman, Natasha Bitca, was left feeling sore after she was shot in the arm by a mystery gunman. It transpired she had been shot by a dog that accidentally knocked over a hunting rifle. 85.Horst Bachmann's pet dog Hajo thought it would be fun to play fetch - with a live World War II hand grenade he had discovered under a bush! 86.Peter Swailes found his puppy, Dino, making mincemeat out of all of the clothes he received at Christmas. Total cost of damage - £135. Total value of Peter not having to wear the sweaters bought for him by his Auntie - priceless. 87.Elsa is a Labrador with an interesting hobby. She enjoys jumping into car boots, whether or not the boot belongs to her owner or a complete stranger. Elsa doesn't even mind if the boot is open or not - she'll jump any way. 88. Pyrenean Mountain Dog Shakey severely cut his nose after getting too close to the cooler fan on an overhauled refrigerator. 89.Showboating Spaniel Tim from Norfolk broke his leg after falling off an unsteady table. 90.Lance the elderly poodle wondered why he had to have his feet in bandages. He’d walked through a pile of burning rubbish and timber and burnt all his paws. 91. Welsh couple Lee and Danielle Cort discovered their Rottweiler puppy Fraser with his head stuck in a cat flap. They had to replace the whole door. 92. Debby Wiseman rushed Paddy to the vet’s in Eastbourne after he began to choke on an acorn. 93. Cassidy wasn't feeling too butch when he trod on a piece of wood with a rusty nail through it. He required stitching and antibiotics. 94. Bud, the Rottweiler was subjected to an horrific ordeal after being shot in the head at close range with a shotgun. Amazingly, the lionhearted dog came through the surgery after having 150 pellets removed from his head. The vet's fee was £6,500. 95. 6 year old Dalmatian Lady, astonished her owners by consuming 10 golf balls. She had to have surgery to have them removed and is now muzzled whenever she's taken for a walk on the golf course. 96. Cross breed, Ricki was lucky to only suffer shock and a few cuts and bruises after being thrown from a moving truck at 60 miles per hour. 97. Monty, the excitable Boxer lived up to his name when he accidentally knocked his owner's teeth out when jumping up. 98. Eagle, a Lab cross German Shepherd broke his leg after falling from a balcony. He was lucky not to have done a lot more damage according to the vet who treated him. 99. Plucky Blue, the Australian Blue Healer suffered puncture wounds after a saving his 84 year old owner from an Alligator attack in Florida. What a brave dog! 100. A Bull Terrier from Sweden proved that dogs quite literally eat into your finances when he swallowed his owner's banknotes. 101.And finally, the tall tale of the dog that got struck on the head by a box of Japanese car parts. Yes, he really did think it was raining "Datsun Cogs" boom, boom!